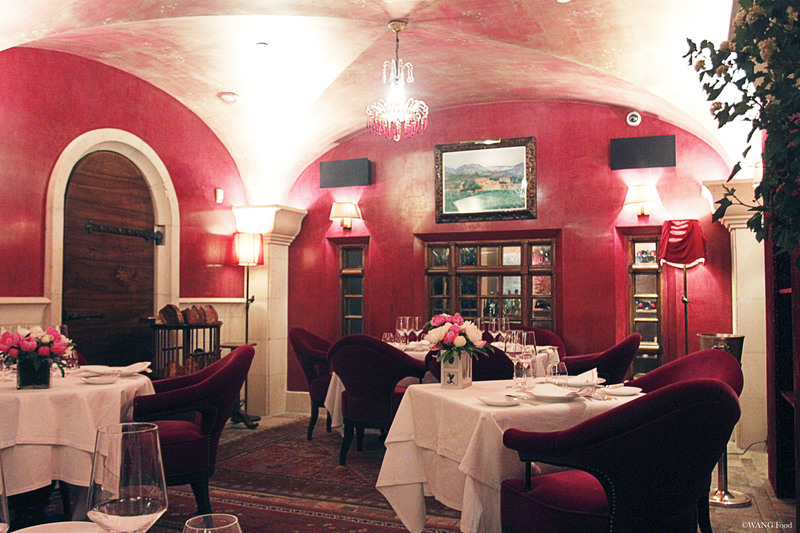 The chef, David Bouley, opened the first Bouley in TriBeCa back in 1987. Before opening his own restaurant, he had the opportunities to work with some famous European chefs, including Roger Vergé, Paul Bocuse, Joël Robuchon, Gaston Lenôtre, and Frédy Giradet. He was also the executive chef of Le Crique, which is one of the legendary restaurants in New York. Moreover, in 1991, Zegat had interviewed 7,000 diners, where would they choose to have the last dinner of their life, the majority had chosen Bouley. 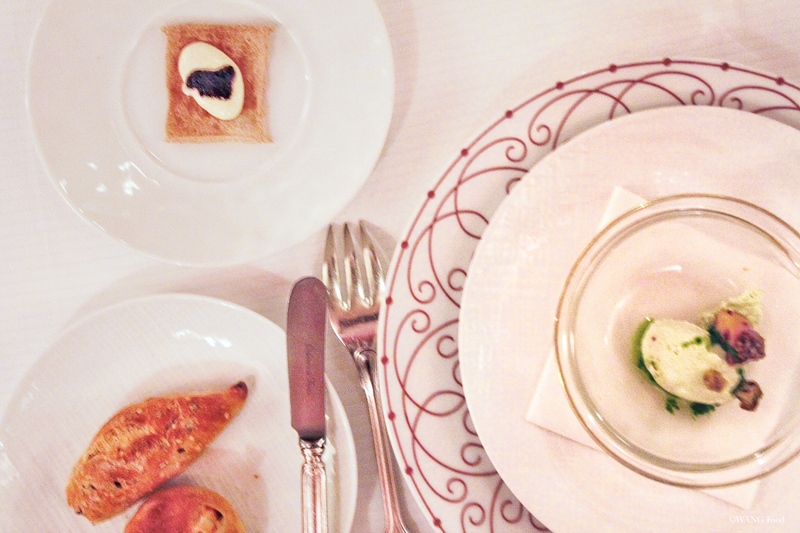 Throughout the years, Bouley has undergone quite a few main renovations. 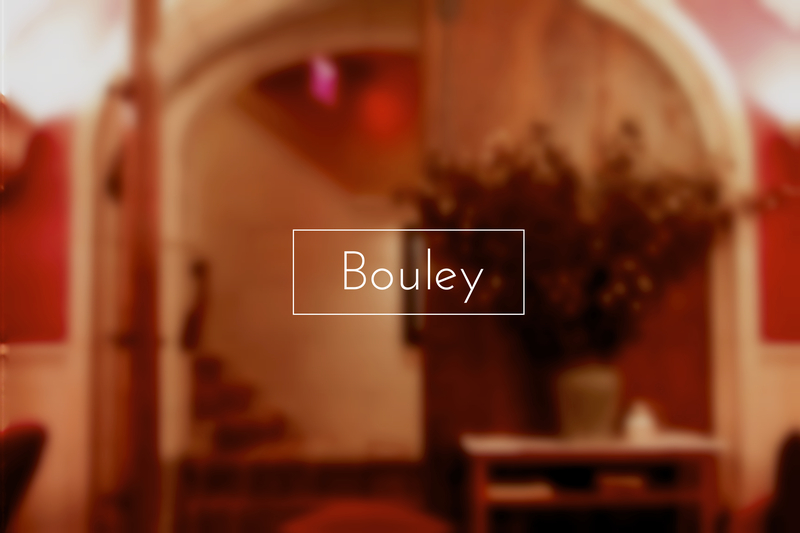 As the current Bouley, it is designed by a famous architect, Claude Puaux, who happened to be Bouley’s neighbor in New York. He shipped closed to 20 tons of stones from France to New York, and assemble it in the restaurant. Each rock has its special color, shape, size, or texture. Moreover, the artworks on the wall are created by the artist Wouter Dolk. 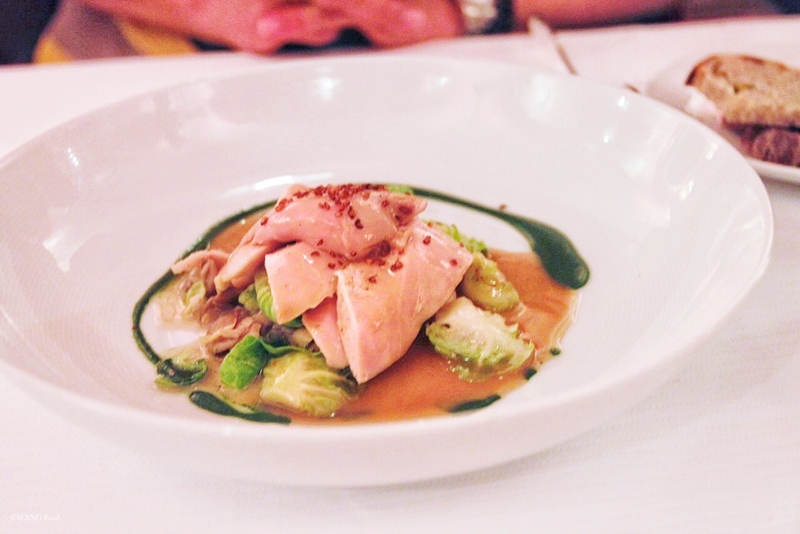 Enough about the history, here comes my experience at Bouley. Though I forgot to take a picture about it, but as soon as we opened the door of the restaurant, we were welcomed by a huge wall of fresh apples. They somehow acted as a natural air refresher. As the waitress led us through the restaurant, and to the basement, I was surprised by how big the restaurant is. The main floor is bright and white. In contrast, the basement is cozy and red. (Therefore, excuse the color of my photos….) There are only 6 tables in the basement, and the noise level is actually lower than the main floor. 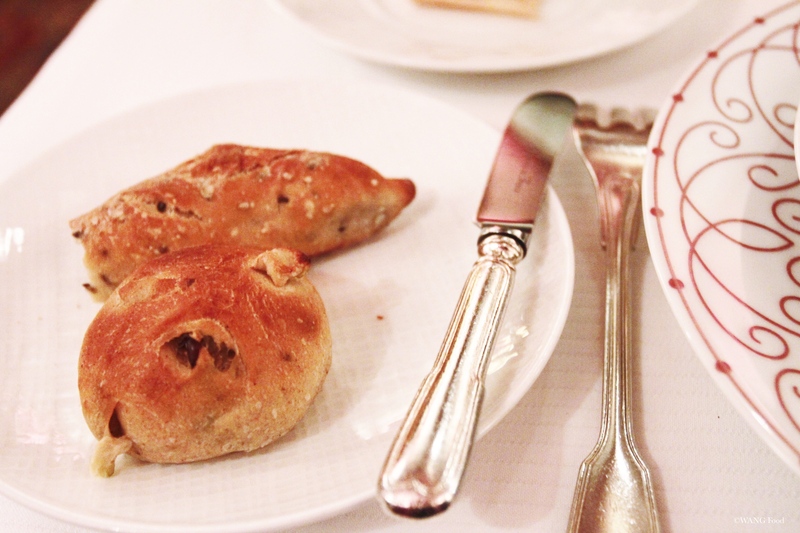 Two amuse-bouchees, which is not part of the 5-course, and two house-made breads (did I mention they have a Bouley bakery next door?). The top-left is mushroom truffle on cracker, which was aromatic, creamy and smooth from the cream cheese base, and the cracker was crisp. The bottom right is another amuse-bouche that I forgot what the name was, but it was like a foamy dish, quite refreshing. This bread cart caught my eyes while we were waiting for our food. It has 8 different types of bread, and you can have a slice of each if you want, but I would recommend save your stomach for your food. However, their breads were good. 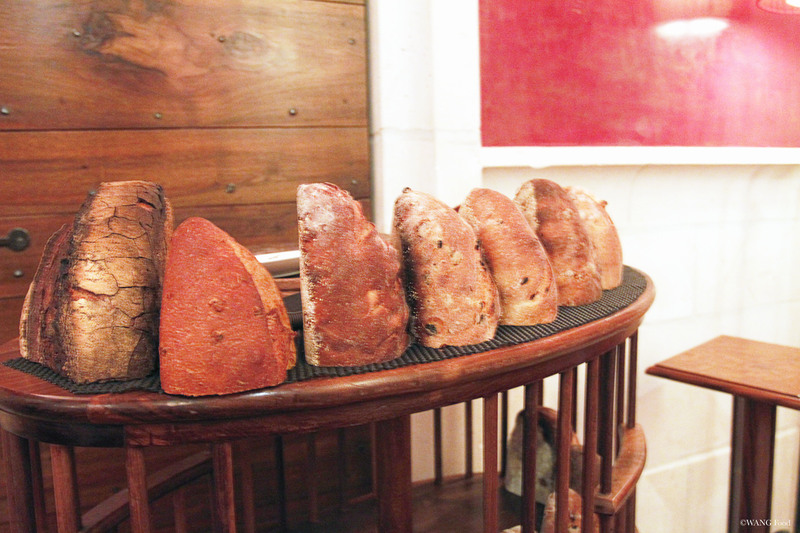 It’s artisanal breads with nuts and dried fruits, such as pistachio and dried cherries, walnuts and figs, garlic, almonds and cranberries…etc. The breads were moist and soft. First course: Hawaiian Hiramasa & Nantucket Blue Fin – I always opt for anything that’s seafood. These thinly sliced hiramasa are topped with caviar, and placed on the sauce that’s made out of Meyer lemon, passion fruit, and fresh verbena. The lemon and passion fruit give a sweet and tart taste. It was a good combination with the fish. 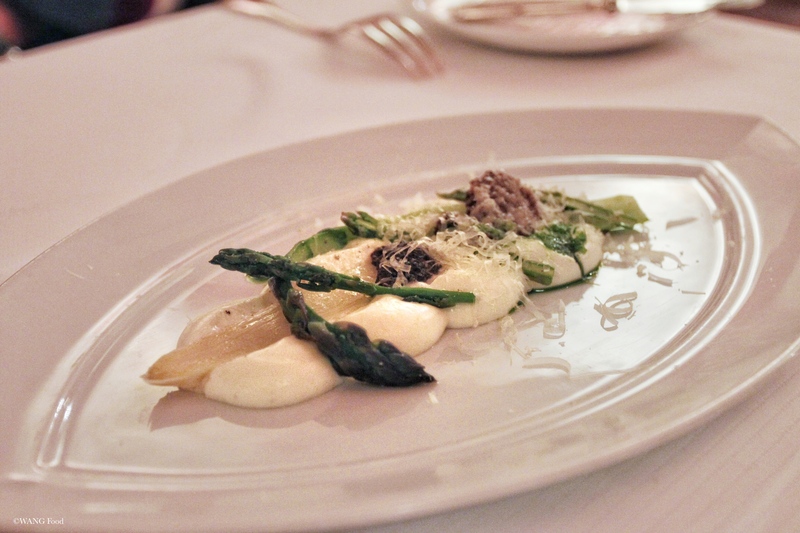 First course: Organic Jumbo Green Asparagus – It was served with some greens, and topped on 24 months comte cloud. The asparagus were just asparagus… However, the comte cloud was a great complement! The comte cheese was smooth and fluffy, just like ricotta, which kind of mask the earthy taste of asparagus that some people dislike. 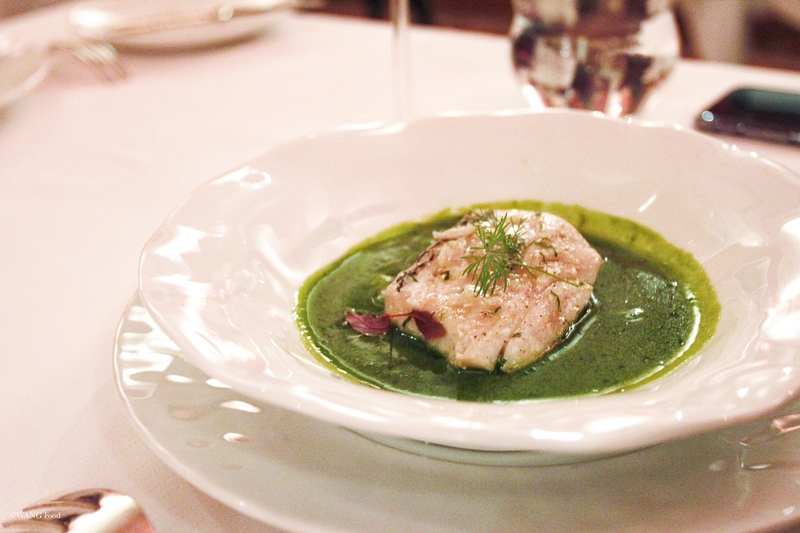 Second course: Fresh Chatham Black Bass – The Ocean Herbal broth is blended with organic peas, and lava beans. The creaminess is right on the spot for the soup. It wasn’t too creamy for the hot summer day, but wasn’t bland. The doneness of the black bass was perfect. It wasn’t overcooked or undercooked. 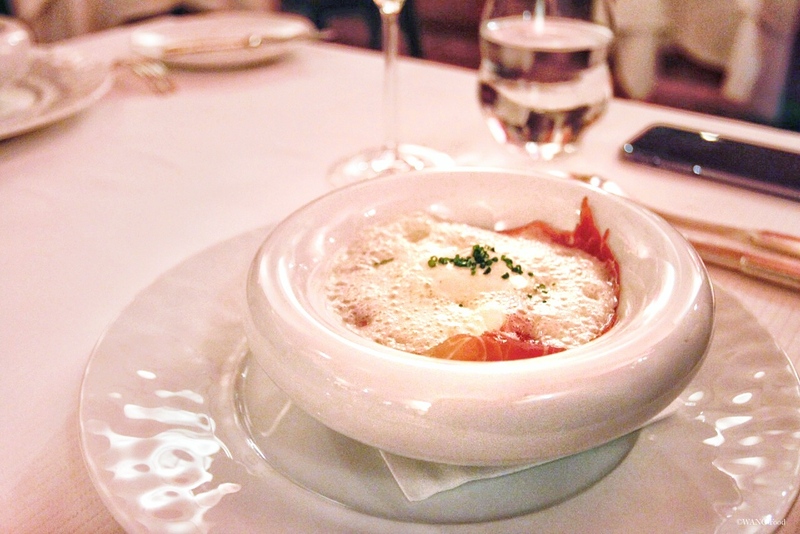 Second course: Organic Connecticut Farm Egg – It’s composed of Serrano ham, steamed polenta, artichoke, sunchoke, and coconut garlic broth. The poached egg completed blended with the polenta and broth. The saltiness of the ham stood out as it’s coated with the creaminess from egg, and broth. Main course: All-Natural Pennsylvania Chicken – The chicken is baked “en cocotte”, which means it was cooked individually in cream/butter in a small ramekin, with alfalfa, clover hay, organic butter beans, and Brussels sprouts. The chicken was so tender that I didn’t feel like it was chicken at all! 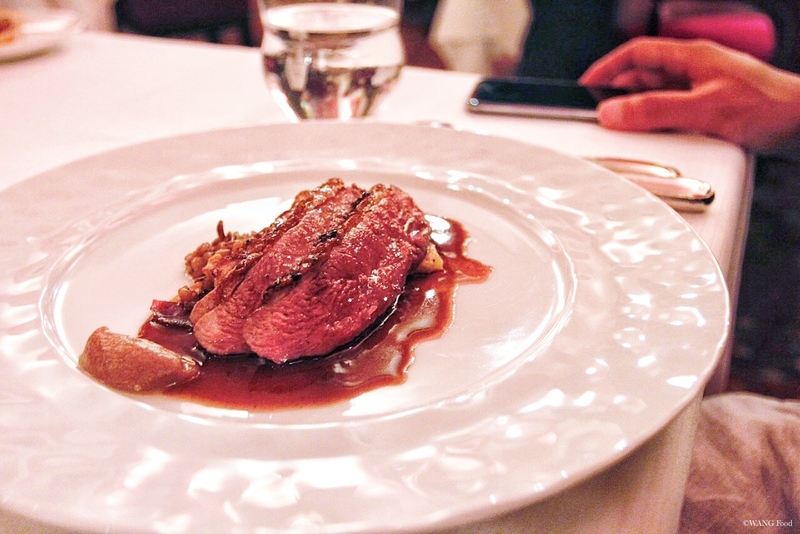 Main course: Organic Long Island Duck – It was served with Indian Reservation wild rice, wheat berries, black dates, and hand-milled polenta. I asked my brother for a piece, and it was delicious. It’s tender, no unpleasant duck-y odor, and wasn’t bloody. 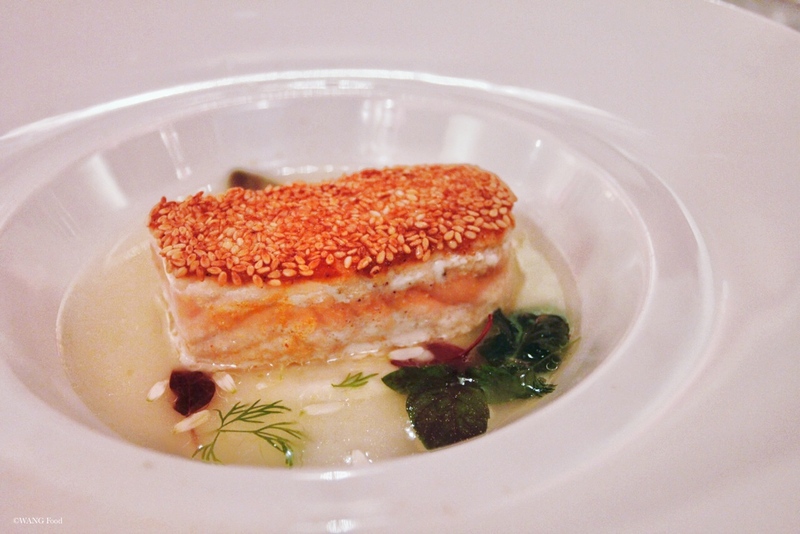 Main course: Wild Alaskan Salmon – The salmon had a sesame crust, and served in tomato water, which is flavored with lemon thyme, lemon grass, and spring onions. The sesame crust was crispy, and the tomato water was so clear but flavorful. The salmon was soaked with all the broth. Fourth course: Chilled Coconut Soup – We all opted for the same one. When I saw “soup”, I was expecting something like regular soup. However, it was more like a pre-dessert. 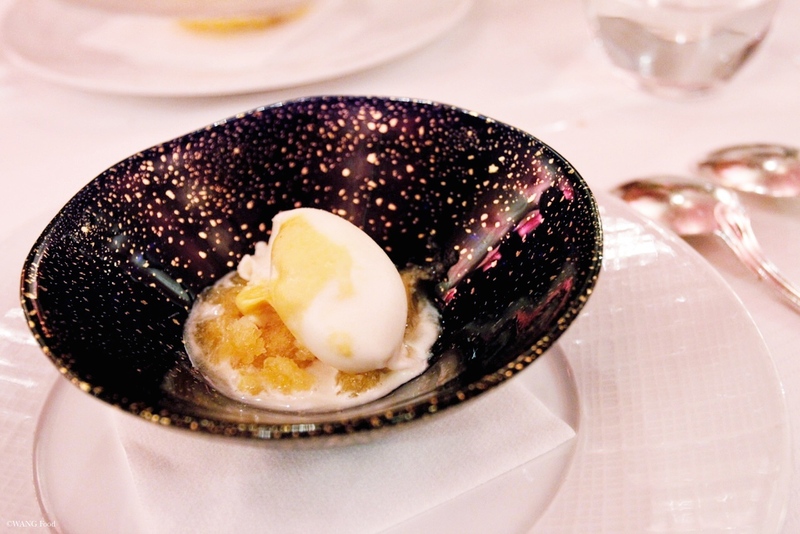 The “soup” is based with Pineapple granite, 10 exotic fruit sorbet, passion fruit, and coconut ice cream. It was refreshing after so many courses. The coconut was light, and refreshing. I’m glad that it wasn’t like coconut milk, which could be heavy. 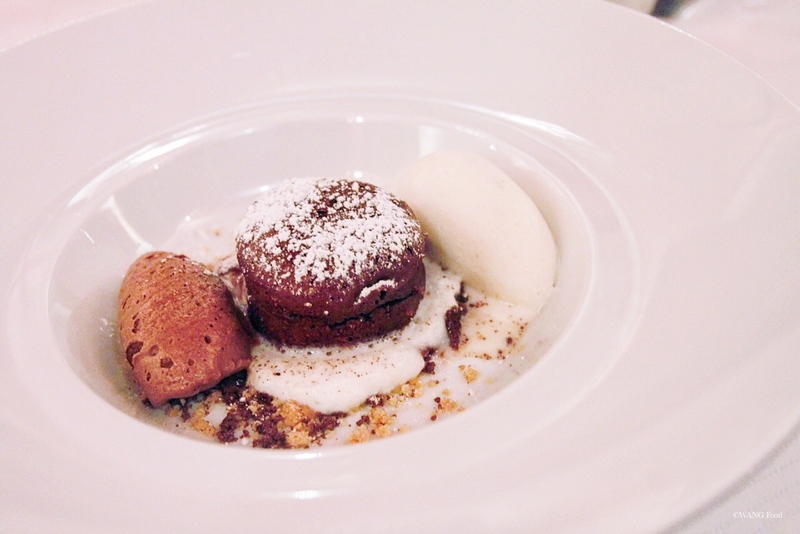 Dessert: Hot Valrhona Chocolate Soufflé – The soufflé is served on white coffee cloud, and along with coffee ice cream, and chocolate mousse. Coffee and chocolate just a perfect combo. The taste of the white coffee cloud was rather subtle compared to the ice cream and mousse. The soufflé was fluffy, airy, yet smooth. I was glad that it didn’t completely deflated by the time I finished taking photos. Dessert: Hot Caramelized Anjou Pear – The pear was cooked in hot toffee sauce, and based with Valrhona chocolate, and biscuit breton. It was kind of like an upside-down cake to me. 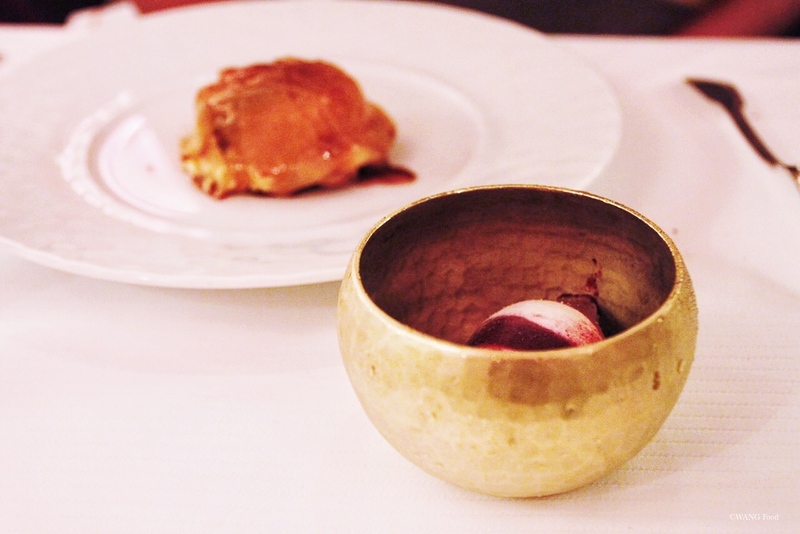 The Huckleberry and Tahitian vanilla ice cream was served in a separate bowl on the side. It was good, but a bit too sweet for our taste. 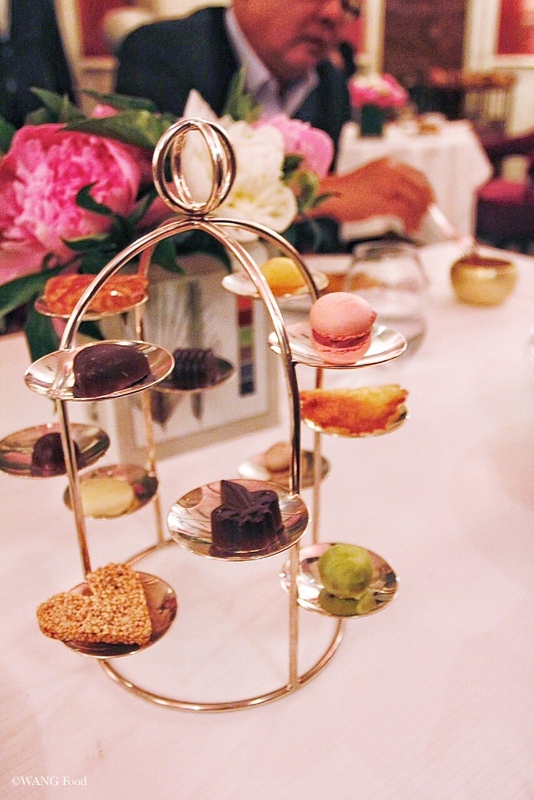 Petit four – Classic french meal ends with petit four. However, it was a lot more than I expected since the petit four I had elsewhere were pretty much just one or two bites of sweets. I had a bite of each, except the chocolate. I really like the sesame cookie. Overall, it was a pleasant meal. The waitresses and waiters were attentive and friendly. When we were leaving, we were each given a poppy seed lemon pound cake made by their bakery! 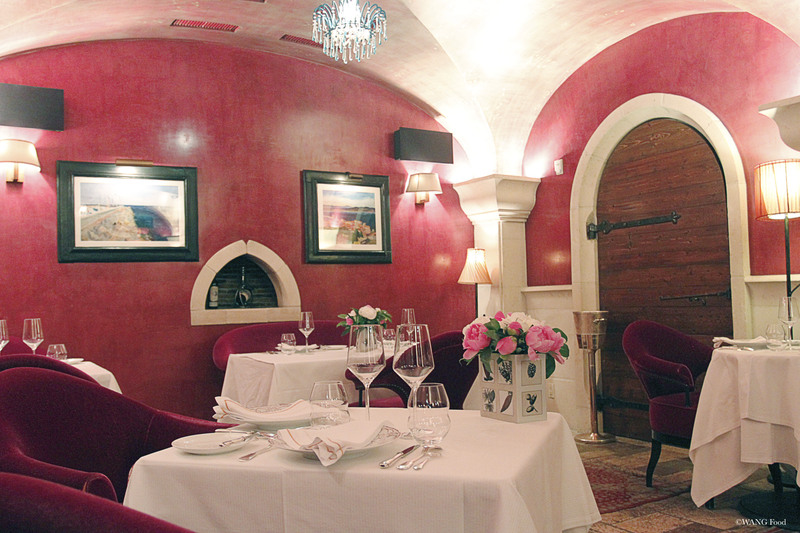 The ambiance was great, as if we were dining in a castle. I was glad that my family was satisfied with my choice, and thought that $55/person was definitely a great steal. Note: Dress code is business casual; jackets are required for gentlemen. 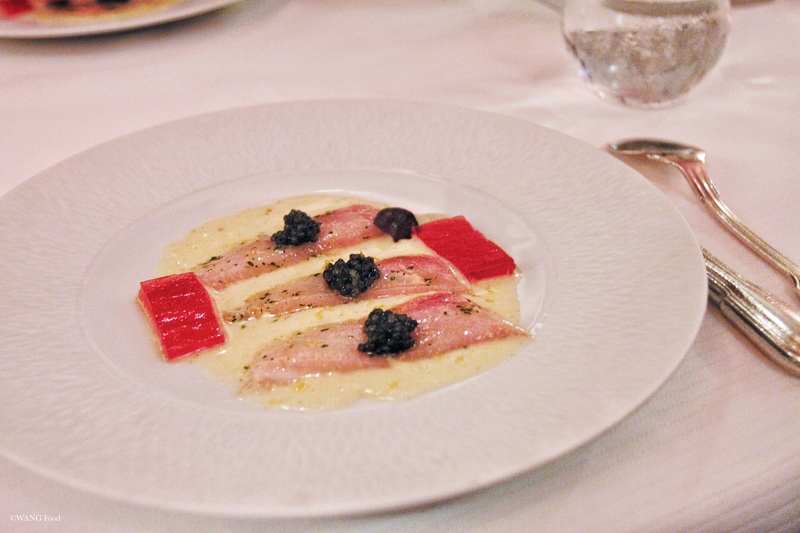 This entry was posted in "Eat"away, New York City and tagged Fine Dining, French cuisine, Michelin, New York. Bookmark the permalink. That is such a nice tradition your family has! And very interesting history – thank you for sharing that. Your descriptions and pictures are beautiful, as per usual :) It does indeed look like a steal! !